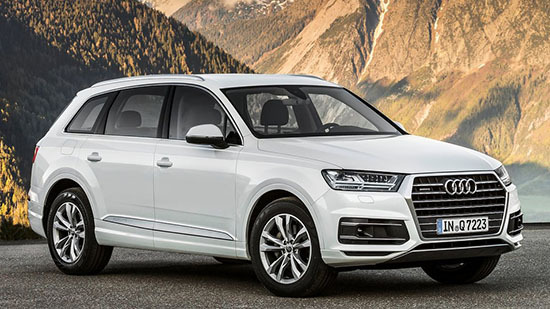 Burlappcar: 2016 Audi Q7 starts at around $56 000. Or, basically, about $6000 more than the much better looking previous generation. And, of course, no more diesel version for the US market. It is also about $5000 more than the new Volvo XC90. I am not a big fan of the new Volvo SUV. But the Q7 makes it look like Marilyn Monroe. I really think the new Q7 is one of the worse designs in the past years. Much worse than the previous one. And now it also looks cheap. Plus, the interior seems really bad. At least in the pictures (I will see for myself next week at the L.A Auto Show). I sat in the new XC90 last year, and was extremely impressed with its interior. All I can say is: good luck! Vince - I've often disagreed with you in the past. But on this one, I couldn't agree more. Audi's design direction is really taking a giant leap backward. what a huge joke, it's like a designer from a competitive company infiltrated both audi and especially VW and their mission was to ruin their designs.....Mission accomplished! Anonymous 9:14 PM, I agree with you only in the SUV side of the brand, the cars are not taking a leap backward, they're just not moving at all. They keep basically repeating the same design they've had for the last 20 years while everybody else keeps innovating. Dream on NB. Crisis breads opportunities. VW group coming back stronger than ever!!! The XC90 is actually really nice in person...the photos don't do it justice. Is it possible the same is true for this Q7...hard to believe based on these photos. The XC90 will be tough to beat on styling--inside especially. I think this is way too much for a Q7 considering 1) it's "UNinspired looks"; 2) A BMW X5 and Mercedes M are much better looking and about this same price; 3) The Lexus Rx is equally uninspiring as this Q7--but $10k cheaper; and 4) When you get over $50k -- you better (at least LOOK, if not) BE SPECTACULAR. This isn't. Even the less expensive Jeep Grand Cherokee has the Q7 beat by a mile! I've pretty much been an a Audi fanboy since the 80s. I have owned lots of them and they've all been amazing. But this is by far the most disappointing generation of Audis I can remember.